When birch branches began falling in our yard, I knew it could only mean one thing--it was time to attempt Rebecca's Advent Log. 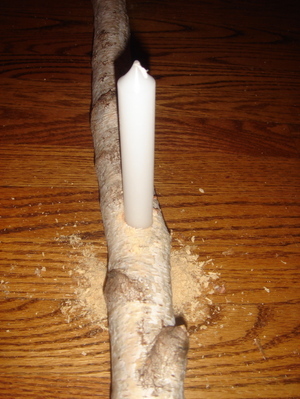 Our selected branch was small, so instead of Rebecca's glorious ruby tapers, we chose utilitarian emergency candles from CVS. 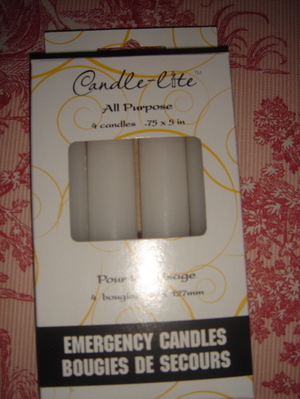 (This may sound like an odd selection, but the emergency candles were readily available, relatively inexpensive, and the perfect size for our handy branch.) The ample Christmas candle is a mottled cranberry, guaranteed to give the room a merry glow on December 25th! 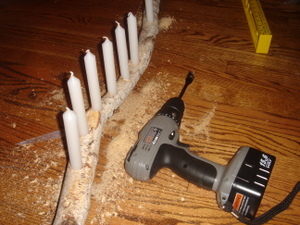 Dh went to Sears with a sample candle for just the right drill bit, making the job relatively easy. Perhaps my favorite part of the process was watching Agnes' reaction. How politely she suggested that perhaps the living room was not the best place for a project such as this, and how maternally she held on to Maureen and Patrick, warning them to avoid both drill and saw! Dh and I had to laugh--she is turning into the two of us! 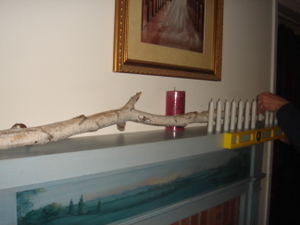 Now, needless to say, this is still something of a work in progress--it will need fresh evergreens from the yard, and the red candle, too large to be drilled into the branch, will be raised. 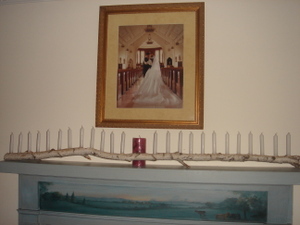 Our wedding picture must be stored away lest it go up in flames. Still, don't you love it?! When Dh was finished, I sat on the couch for some time admiring the way he brought Rebecca's family tradition to life (at least to a modest extent) right here in our living room! Thank you, Rebecca! With each candle we light this Advent, a prayer will go up from our home to yours! This is simply beautiful! You've inspired me. It's wonderful! I do love it! And I am thrilled to see that it CAN be done with a drill bit rather than a press, makes the whole process more friendly. 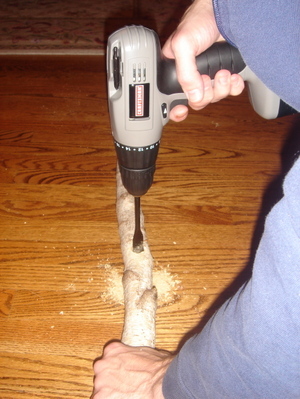 Can you share what size bit Chris used to drill the holes? Rebecca, I will find out the size of the drill bit. More than once, dh remarked, "This drill bit is perfect!" as he worked. He brought the candle with him to the store and found an exact fit. The candles are very steady and secure. Thank you, dearest Amy (and all of you sweet friends)! Would you believe that scene was already there when we bought the house, and I hadn't noticed it during our many walk throughs of the place? I did not see it until our first day moving here, and I exclaimed, "I LOVE THAT SCENE!!! It looks like Fatima!" It actually has a church in the center with a little cross on the steeple, and the blue mantle reminds me of the Blessed Mother! I do not know if the previous owner hired an artist to paint it or if the mantle was purchased with a scene already in place. It is difficult to tell by looking at it. Gorgeous, Alice! I hope that when the time comes, you will post pictures of it all alight! And God bless precious Agnes. She has such a heart for tiny children. I wonder where she gets that? That really is gorgeous. How sweet your Agnes is. 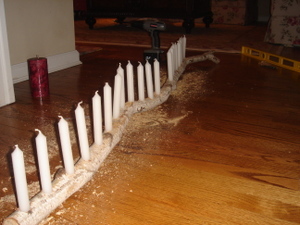 Ever since reading Rebecca's post about her Advent log, I've been wanting to find a tree branch to use. Unfortunately, we live in a neighborhood that does not have big trees. It gorgeous! I would love to see it with the greenery too. I adore how we share ideas and adapt for our own families in this wonderful way! What a merry glow Advent will have in your home. It's so lovely and what a great job he did!! How wonderful! I hope you post once again once the evergreens are in place. So great!